The majority of ACL injuries are sustained whilst playing sport. Therefore it is no surprise that patients typical goal is to return to sport as quickly as possible with the aim to play at the same standard/level as pre-injury. There are many different return to sport criteria’s that have been developed to ensure a successful return to sport and minimise the risk of re-injury. Some criteria’s are driven by purely “time” , I am sure you have heard the usual 9-12 months as the guidelines before returning to sport after an ACL repair? Other criteria’s combine “time” and “outcome measures” (that is meeting physical milestones). Recent studies have indicated that it is important to have a rehabilitation program driven by a Physiotherapist who combines a rehabilitation program of timeframes, milestones, sports specific testing, psychological readiness and ensure each individual passes the specific discharge criteria BEFORE they return to their chosen sport. Research has demonstrated that patients that do not meet the discharge criteria before returning to sport are FOUR times more likely to sustain an ACL graft re-rupture compared to those patients who passed the return to sport criteria. 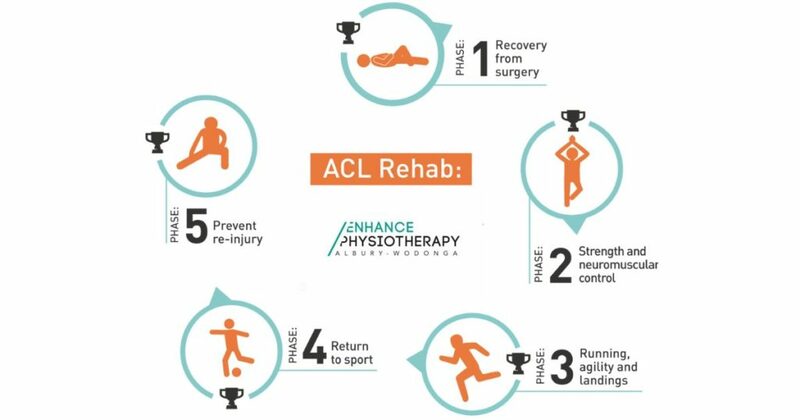 At Enhance Physiotherapy, our Physiotherapists are experts in ACL rehabilitation with particular focus on the combined multifactorial approach of assessment and treatment before returning to sport. Running Shoes: How to know what will suit you?